His power: Pyro can manipulate any nearby flame with his mind to make fires shrink and grow. 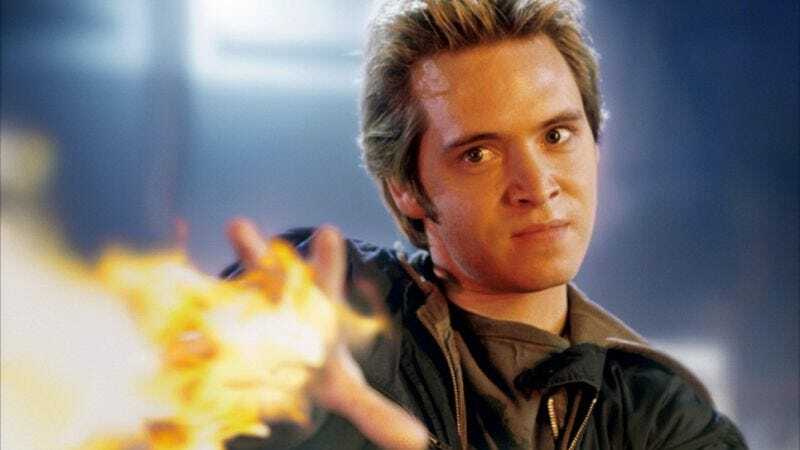 His story: Pyro initially appears in a small cameo role in X-Men as a student at Xavier’s School For Gifted Youngsters, where he flirts with the new girl, Rogue, by creating a fireball in his hand during class. Bobby Drake freezes that fireball, setting up a rivalry that gets more attention when Pyro is recast and given a larger role. X2 reveals that John, Bobby, and Rogue have settled into a trio, and even though John is far more aggressive in his reaction to anti-mutant hostility, Bobby and Rogue consider him a close friend. They stick together to escape when Col. William Stryker attacks Xavier’s School, and once they get to Bobby’s childhood home, Pyro decides that he is done giving any shits about human life. Pyro attacks the police when they arrive at the Drake home, and he firmly decides to leave the goody-good X-life behind once he meets Magneto and Mystique. Pyro is a member of Magneto’s Brotherhood in X-Men: The Last Stand, and his big role is to incite fear in the wake of Worthington Labs announcing its mutant cure. He runs into his old friend Iceman during a terrorist attack in a crowd of mutants, and is taken out by his icy rival during the Brotherhood’s assault on Alcatraz Island. It’s unknown if Pyro perishes when The Phoenix lights up the island, but ultimately it doesn’t matter because X-Men: Days Of Future Past erases that movie from XMU continuity. Currently, Pyro is: His current status in the new timeline is unknown, and flashes of Xavier’s School in the present don’t show any signs that Pyro has stuck with the forces of good, if he’s around at all. Where will we see her next? Pyro has no future appearances confirmed, but that doesn’t mean his flame has gone out given how the XMU has recycled characters in the new continuity.